You’ve been working diligently to achieve that ever-so-elusive balance between gross sales and profits, and have managed to control your operating expenses to yield a nice net operating profit. You’ve worked for many years to develop and maintain a good customer base. You have a staff of highly trained and competent people. And yet, you’re confused as to why the numbers don’t always add up. Here, you will learn how to achieve your automotive service repair goals by consistently managing these specific financial tools. It must be stated right now that at Automotive Consultants Group, Inc. (ACGI), we’ve developed, refined, and are continually updating these tools, and have been for the last 16-years. Nonetheless, they are fairly basic in their design, such that once you understand their importance and what they tell you, you can them simply gather your needed numbers, develop your own format, and you’re off and running. It should also be understood that any report should yield only one primary purpose: to tell you something that will aide you in managing your business. This entry was posted in ACGI on June 1, 2016 by Scott Wheeler. Forecasting what your fourth quarter might look like takes a little work and a lot of initiative, says Scott Wheeler, owner of Automotive Consultants Group. But he says it’s well worth the effort. Sales forecasting helps ensure you know how much money the shop is bringing in on a monthly and annual basis and can be used to develop financial plans, benchmarks and goals. “In the automotive industry, typically you can ‘make hay’ during the summer months,” says Wheeler. “But what about handling the cyclical ups and downs we all experience? You need to forecast and plan ahead.” Wheeler frequently works with shop owners to calculate their sales forecast and discusses the numbers needed to create a regression equation to project numbers into the future. There’s a simple tool used in forecasting and financial analysis. The math behind it is called a “linear regression tool.” While it is recommended to use Microsoft Excel to perform this, it’s important that you understand the mechanics of it first. At the center of the regression is the relationship of two variables, called the dependent and interdependent variables. For instance, suppose you want to forecast your repair shop’s sales variables, and you’ve obviously concluded that as car count increases, sales goes up. But what about the efforts of your marketing and advertising? Your sales forecasting would be the dependent variable, as it is “dependent” on your advertising. And the advertising would be the interdependent variable. As the advertising increases, the car count should go up. One is dependent on the other. The relationship between two variables is called covariance. If one variable increases and the other variable tends to also increase, then the covariance would tend to be positive. If one variable goes up and the other goes down, then the covariance would tend to be negative. Simply put, correlation coefficient is an attempt to standardize the relationship between the two variables. If you increase your marketing/advertising by 1 percent, will you always get a 1 percent plus increase in sales? In essence, this is a “cause-and-effect” relationship. As previously mentioned, you need to establish a baseline of performance. If last year’s profit and loss (P&L) statement was a relatively standard year, then this tool can help you to establish your baseline. However, the caveat is that if a business remains flat, then it is, in fact, dying. The reason for this is simple—increased costs of doing business and inflation. Therefore, your forecast should include at minimum a 10 percent increase in gross sales. In theory, this should keep you ahead of the curve. However, it’s more complex than that. Forecasting sales will allow you to more closely execute and control your budget. Let’s look at an example. You want to start by entering your annual targets (Example 1). Again, I get all of these numbers from the profit and loss statement and then add 10 percent. Then, you always want to measure what the variance is compared to the target. I suggest measuring all of the above on a daily basis. It just takes 3–5 minutes at the end of the day to pull these reports. In Example 2, you can see how the above targets interact with the data on a daily basis. You can see when you’re up and down, especially in comparison to the annual target. I also recommend looking at this on a quarterly basis. That will give you a higher level view of where you are overall. By now you should understand the importance of sales forecasting. It’s a look into the future. You should be experienced at goal setting and attainment. You need to look back at your previous performance and come to some solid conclusions. You need to be realistic about how much work your shop can handle. You need to understand how to use Excel. You need to understand why you have ups and downs in your business. You need to be properly staffed, and at the right times during the year. You need to budget and plan ahead for major purchases. This entry was posted in ACGI on December 6, 2015 by Scott Wheeler. Feel free to get as specific as you want because, amazingly, if you’ve been tracking the proper data, you can actually take an active approach toward making that question a reality through detailed searches on your management system. To effectively use more complex search strategies, you need the proper information from your customers. But asking questions and collecting data for your management system is just the first step—utilizing the program and all of its benefits to improve your marketing efforts and capitalize on gross profits is the end goal. Before checking a customer out, make sure to get all the pertinent information: model and year of the car, VIN number and odometer reading; name, address, email address and phone number. Simple enough. But what’s next? Once you’ve actually gathered all this data about your customers and uploaded it into your management system … what do you want to do with it? The entire concept behind more complex searches is rendered useless if you don’t have the right information already in the system. Seemingly, this is the simplest step in the process: Ask customers the proper questions and track the key data about their vehicles. But, as Wheeler notes, the most basic steps are sometimes the most negligible ones. When service writers converse with customers, basic information about the vehicle and the customer should be noted. And, as an owner, you can actually use your management system to ensure the data is tracked consistently for every transaction. • What work are you looking to improve sales on? Do you want to increase your heavy line work? Diagnostic work? HVAC systems? Clutches and transmissions? • Who are you marketing to? Are you failing to get millennials in your shop? Do a majority of your custom ers drive Ford, Audi, VW? Do they live in certain neighborhoods? Do they respond differently to different marketing techniques? • Are your advertising efforts working? Are your direct mailers bringing people in? Are your customer relationship management systems driving sales? Did they use a coupon or come in because of a special? • How are people hearing about you? Phone book? Yelp? Google? Facebook? A friend? Do you need to be obtaining more referrals? • When it comes down to it: What data will best allow you to benefit from your strengths or fix your weaknesses? While searching through the repair order history is a universal function on all management systems, different systems present different searching methods. Wheeler is a big proponent of R.O. Writer’s “Management Analyzer” function, which quite literally allows shop owners to create “what if” scenarios. The management system will then pull up what your numbers could look like in the future. According to marketing manager Bob Hammer, NAPA TRACS has exhaustive search engine capabilities that allow users to search down to a specific part number, customer, vehicle, repair order and item. Mitchell 1’s Manager SE system gives shop owners and managers a wide range of options for mining their customer databases, says senior marketing director Nick DiVerde. Its engine allows for searching service categories (tires, alignment, maintenance, diagnostics and brakes)—and you can actually customize this list when setting up the system so the categories closely match the services your individual shop provides. You can also search by year, make, model, customer, and even by description. Managers could search for customers who had a cabin air filter or timing belt replaced. The part numbers and descriptions can be searched with other search terms to include any record that had “tire” in it, for example. The Advance Auto Parts MotoSHOP management system, according to senior manager of eBusiness product management Denise Kelly, allows for shops owners to search repair orders by type (quote, work order, invoice, credit), date (within a time frame of the past week, two weeks, 30, 60 or 90 days), vehicle (year, make, model) and customer. For more information about your management system’s search capabilities, keep in contact with the support staff or local sales representative for the options available to you. Depending how specific you’d like to get, searches on your management system can become quite complex. But sometimes, a simple search of the combined numbers and information of your business summary reports will reveal all you need. Let’s say you want to examine your customers’ preferred payment options. If you’ve been carefully tracking it, you can see how often people use Visa, MasterCard, American Express, etc. Basic search options involve no frills. A simple search such as “Honda” will reveal all Hondas that have come through your shop, or “timing belt” will bring up any job that involved timing belts. You can do simple searches for specific loyal customers that haven’t visited the shop in a while, or seek out an individual repair order’s invoice. These searches can be useful depending on what you’re looking for, but if you’re really serious about searching, then Wheeler says you should employ various “what if” scenarios. Wheeler says R.O. Writer’s “Management Analyzer” uses complex search algorithms known as “Boolean searches,” which is also used by Google and many of the popular management systems for search engines. If your management system has Boolean functions, you could search and find the exact customers that fit your criteria. Your three key words for more complex, Boolean searches are “AND,” “OR” and “NOT” (and yes, they must be capitalized). All three words yield very specific, less varied results. Inserting “OR” into your search will actually broaden the results. If you wanted to look through every bill that ever involved light vehicle bills, truck bills or tire bills, you would search light OR truck OR tire. “OR” can be useful, but using “AND” in between words allows you to narrow your search results. If you typed light AND truck AND tire, all search terms must be present in the resulting records, meaning the bills you pull up would include at least all three of those words. Perhaps you do work on all makes and models, but none of the tires you sell will fit an Audi vehicle? Searching light AND truck AND tire NOT Audi eliminates all light truck tire bills involving Audi customers. This entry was posted in ACGI on September 24, 2015 by Scott Wheeler. Scott Wheeler, president of Automotive Consultants Group, is known within the auto care industry for helping shops grow and improve. He’s an expert at analyzing every aspect of a business, finding problem areas, and methodically implementing solutions. He likens his job to his hobby—road racing a 1972 El Camino. Wheeler has owned the car for 30 years. It’s an everlasting project that’s been through thousands of hours of work including four engines, numerous suspension configurations, a complete body restoration and repaint, and much more. Wheeler works as a consultant seven days a week, but when he has time for himself, it’s spent with the El Camino, trying to figure out how to push the envelope a little further. “The car and the problems and the components and the racing and the logistics, it all parlays directly into my consulting,” he says. Wheeler has raced the car at Road Atlanta, a 2.5-mile course near Braselton, Ga., but his goal is to compete with it this month in the Silver State Classic Challenge, an open road racing event on a 90-mile stretch of State Route 318 in Nevada. He has attempted to run the race in the El Camino before—in 2000 when an engine failure caused him to compete in a rented Cadillac. A new engine still wasn’t ready by 2001, so he ran the race in another rental, this time a Mustang. He still managed to average over 100 mph in both cars. In the Mustang, he averaged 104.87 mph against a perfect run of 105 mph and managed a sixth-place finish. Wheeler put the race on the backburner after 2001 as life and business shortened his hobby time, but he hopes to average better than 150 mph when he gets back into the race this year. Another engine failure—two spun bearings in a supercharged 390ci engine pushing 1,100 hp—left him scrambling in March. The new powerplant is a naturally aspirated 427ci small block making about 600 hp. It’s mated to a custom TH400 transmission—no overdrive, but the car’s 2.73:1 gears make the high speeds tolerable. Shop operators who have worked with Wheeler might recognize his car, which he calls Killer Kameno, from his business cards and website. Even for clients who aren’t car guys, he hopes it shows that the challenges of automotive repair are very familiar to him. This entry was posted in ACGI on May 23, 2015 by Scott Wheeler. Knowing your shop’s capacity, both in terms of sales and production, is key to avoiding bottlenecks and maximizing the number of jobs that can be completed profitably each day. By understanding their shop’s production capacity, owners can work to fix process flaws and maximize sales. Scott Wheeler, owner of Automotive Business Consultants Group, regularly helps shops find their maximum throughput. Wheeler discusses how to calculate your shop capacity and the various factors that need to be considered. It’s important to know your shop’s potential capacity so you can set benchmarks. If you don’t know what 100 percent production capacity would be, then how will you ever know if you’re hitting the mark or not? To do that, you need to understand the capabilities of the physical layout of the shop. I have created several formulas that, together, paint a picture of total shop capacity. To start, you will need your labor statistics: hourly labor rate, number of techs, the number of hours your shop is open and the number of days you are open in a year. First, you will figure out your billable daily hours. To do that, multiply the number of technicians you have by the number of billable hours per technician per day. That total is the number of hours you could be billing in a day. To figure that out for the whole year, multiply the total billable daily hours by the number of available business days. With that total, you can compare your total billable labor hours from last year. Next, we take a look at the shop statistics. The three pieces of information you will need are the number of bays in your shop, the annual number of repair orders (yearly car count), and the available business days. You will use that information to figure out your daily sales capacity and net income. 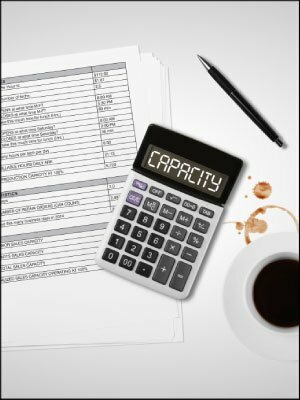 In terms of sales capacity, I look at daily labor, parts and total sales capacity, and then I also look at the annualized sales capacity for a shop operating at 100 percent. The annualized sales capacity will show you, in a perfect world, what you could be bringing in if you billed every hour that the technician is on the shop floor. Then I look at gross profit margin. First, I look at current gross profit margin, which you can pull from your profit and loss statement. To find the gross profit dollar potential operating at 100 percent, simply multiply your current gross profit margin by the annualized sales capacity operating at 100 percent. Then take that total and subtract your less current total operating expenses (which can be found on your profit and loss statement) to calculate your total net income realized. This figure will show you what your net income could be at full capacity. What you should do next is compare your gross profit dollars and your net income from last year to these totals. That’s going to point very clearly to specific operational deficiencies, if they exist. The goal is then to dig in and find out what’s causing the problem. The final piece of the puzzle is your effective labor rate, which is a calculation showing the efficiency ratio of actual sales to total sales potential. The calculation for effective labor rate is simply total yearly labor sales divided by annual available billable labor hours. The reason effective labor rate is important is because many people want to raise their labor rates. But if you’re less than 90 percent effective, you’re going to lose a certain amount for every hour you bill out, even if you raise your labor rate. You should first try to dig into your processes and try to raise your effective labor rate first. I do this exercise with every single client. These calculations demonstrate where inefficiencies exist or if the shop is maxed out. It will immediately tell you what you have to work on to get the most out of your staff and your space. This entry was posted in ACGI on January 27, 2015 by Scott Wheeler. Regain the magic you once felt. Why do people fall out of love with their auto repair businesses? This could happen for any number of reasons, but primarily it occurs because they lose hope due to the various challenges they face: increased complexity of the vehicles they service; lack of highly trained, qualified techs; loss of profits; poor cash flow; long hours; loss of customer loyalty and burnout. And of course, there’s also the sluggish economy. I think it’s due to the lack of proper training and education, including goal setting, and lack of a “Plan B.” When I ask how many of my clients started with a legitimate business plan, the answer is close to zero. The people I’ve spoken with who have shut their doors feel a tremendous sense of sadness, failure, uncertainty for the future, and really don’t think they can work for anyone else. They are dismayed that all of their hard work has resulted in nothing. Their ship is suddenly without a rudder, and they’re not prepared to meet the rest of the world on its terms. Many of the business owners I work with feel a tremendous sense of loyalty to their employees. Many of them will carry on even if the “writing is on the wall” because they don’t want to admit failure and let everybody go. How can those feelings be avoided? In my 36 years of experience, I’ve only encountered a handful of business owners who had a business degree. They have often been educated in one of two schools: the first is the so-called “School of Hard Knocks,” which is very expensive and frustrating; and the second is getting management and business training through any number of training classes. Reading is an easy way to stay on top of your business. There are thousands of books on business management. In addition, having a solid business plan – complete with contingencies for common pitfalls such as poor cash flow – to rely on as your guide is so important. What are some tips for falling in love with your business again? First, be very clear about your goals. Not too many shop owners really take this seriously. You do have to be realistic, though. If you only have two bays, it’s not likely you’ll do a million dollars in gross sales. Second, write down a comprehensive plan of action. Ignorance is OK, but only temporarily. Take stock of your current situation. Begin with what net operating profit is desirable and mandatory, and work from there. What are your total operating expenses, exclusive of parts and loaded labor costs? How much in gross sales and what gross profit margin is required to attain your particular net operating profits? Paying attention to your numbers is crucial, too. You need to know what your key performance indicators (KPIs) should be, and know when you’re hitting them. More importantly, you must know how to make the numbers go up or down. In other words, when a tech breaks off a bolt performing an exhaust manifold gasket repair, how will this affect your profit-and-loss statement? What effect will this have on customer loyalty? What about the throughput of work in the shop? Your business is nothing more than a math problem, so if you don’t know or understand the math, get educated. The mantra, “If you can measure it, you can manage it,” really applies here. Next, examine your processes closely and determine what is working, and what is not. Do you have a proper work dispatch system in place? Do you have effective service consultants at the front counter? Do you have essential systems and processes in place? Make sure the systems you have in place are realistic for your business. What’s the key to executing change? In my presentations, I show a “triangle of change.” The triangle is one of the strongest geometric shapes known. What is unique is that each leg supports and is likewise supported by the other two legs of the triangle. But take just one leg away, and it collapses on itself. So, if one is trying to effect change, at the center of the triangle you must have all three legs present and in the proper measures. One cannot effect change without commitment to that change, a solid game plan, and taking action on that plan. If you take away any of these essential ingredients, then change will not occur. If a person has solid commitment, and a plan, but takes no action on that plan, then change will not occur. And lastly, if someone takes action toward their plan, but has no real commitment, then as soon as the first obstacle presents itself, change will not occur. What are the steps to effective goal making? The goal should cause you to learn, stretch and grow as a business owner. How do you find out what you really want? Your goal must be clearly stated and written down. You have to be very clear about it, and it cannot be minimized or ignored. Ask yourself if this is really your goal. Maybe it was the husband’s goal, but he has since left the business or passed away and the wife is now running the operation and it’s not her goal. Next, you should include a timeline. Do you want this done next week, next month, five years from now? Ask yourself the following set of questions: What do you want? When do you want it? What are you willing to give or give up to get it? And finally, you’ve got to identify the obstacles to overcome. There’s going to be some problems along the way. You have to be able to anticipate that and have contingencies in place. What are you going to do if cash flow gets tight? What are we going to do if we experience another recession? Try to take advantage of all the resources that are available to you, like groups or coaches. There are a lot of places out there that assist people step by step to go through this. Also, identify what skills and knowledge you need. I’m still amazed by how many people think P&L stands for parts and labor, instead of profit-and-loss statement. It’s a very serious document they need to be able to understand to effect change in their business. How can people start to change their attitude toward their repair business? The automotive service business is a tough business. The vehicle owners who come into the shops have problems, they want it now, and they want it achieved without any problems. The very nature of what we do is demanding. It can chip away at even the best of attitudes. Change to most of us is uncomfortable and many people are resistant to change. But the definition of insanity is doing the same thing over and over and expecting different results. So that’s going to mandate that either change is eminent or they will be forced to close their business. Editor’s Note: This article is one in a series of management articles contributed to AUTOINC. by Automotive Management Institute (AMI) instructors. To learn more about AMI, its courses and instructors, visit www.AMIonline.org. AMI administers the distinguished Accredited Automotive Manager (AAM) program. W. Scott Wheeler, president of Automotive Consultants Group Inc. (ACGI) is a shop management expert in the transportation industry, with more than 36 years of experience in the automotive, trucking, heavy equipment, marine, motor sports and defense aerospace industries. He holds numerous ASE credentials, including two master’s certifications. He has experience working in every position from tech to fixed operations director to mechanical engineer. Wheeler has authored four books for the automotive industry. He continues to write, consult and speak professionally at major industry events throughout the U.S. and Canada. He can be reached at scott@automotive consultantsgroup.com. If you are new to ASA or even if you are not, be sure to check out our social networking communities on Facebook, Twitter and LinkedIn. Go to www.Facebook.com/asashop to “Like” us, follow us on Twitter@asashop and join us on www.linkedin.com/company/ automotive-service-association. This is a great way to get news and information that you might not find elsewhere. Stay in touch with ASA through news feeds, get tips to help your customers keep car care maintenance top of mind, receive legislative alerts to keep repairers informed and so much more. Get social today! This entry was posted in ACGI on September 15, 2014 by Scott Wheeler. We’ve Presented Management Solutions in over 25 cities including Canada in the last two years, sponsored by WorldPac Technical Training Institute, ASRW, ASA/VISION, and ACGI. This entry was posted in ACGI on August 5, 2014 by Scott Wheeler. This entry was posted in ACGI on September 5, 2013 by Scott Wheeler.